Defense Distributed (DefDist) Liberator Pistol: World’s First Completely 3D-Printed, (Almost) All-Polymer “Wiki Weapon” Gun. Will it Float? | DefenseReview.com (DR): An online tactical technology and military defense technology magazine with particular focus on the latest and greatest tactical firearms news (tactical gun news), tactical gear news and tactical shooting news. Defense Distributed (DefDist) Liberator Pistol: World’s First Completely 3D-Printed, (Almost) All-Polymer “Wiki Weapon” Gun. Will it Float? The following article is property of DefenseReview.com (DR) and is copyrighted material. If you are reading this article on another website other than DefenseReview.com, please email us the website address/URL (where the unauthorized DR article reprint is located) at defrev (at) gmail (dot) com. Thank you. Leftist gun-grabbers/Second Amendment deniers everywhere will really dislike this development. DefenseReview's (DR) favorite friendly neighborhood libertarian anarchist, Cody Wilson, has just upped the ante on 3D-printed firearms components/parts. 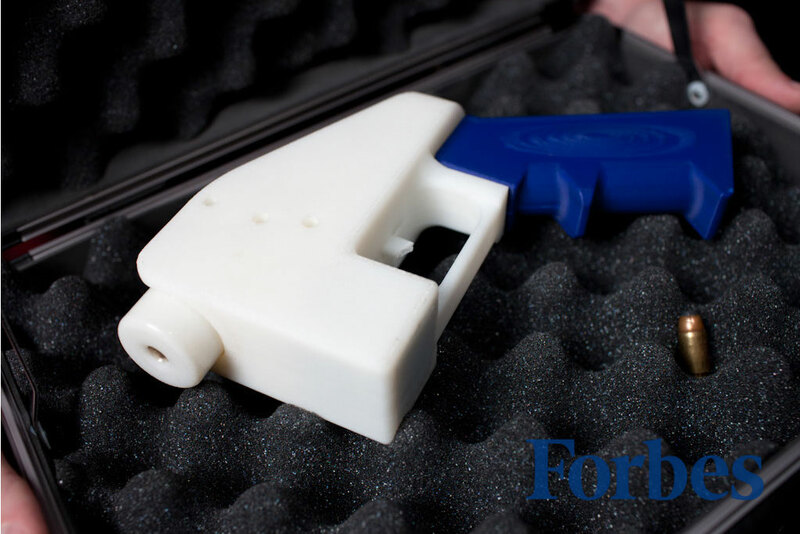 His outfit, Defense Distributed (DefDist), has just developed and introduced the appropriately-named DefDist Liberator pistol (catchy), a completely additive-manufactured/3D-printed gun. Even the barrel eschews metal and is instead made from polymer. Not sure how smart that is, but o.k. Anyway, Forbes Magazine published a story on it yesterday, and it's an interesting read, especially for Forbes. A little joke. While the Liberator all-polymer "Wiki-Weapon" pistol is reminiscent of fictional metal-detection-defying plastic/polymer pistols like the "Glock 7" pistol from "Die Hard 2" (1990) and the side-by-side double-barrel derringer-type pistol from "In the Line of Fire" (1993), and doesn't exactly instill in us a sense of safety for the shooter, it's a very real pistol that doesn't require advanced manufacturing machinery or molds and handwork. All you need is the CAD design program, the right printing software, the requisite polymer material (ABS plastic, etc. ), and a 3D printer. The verdict: it worked. The Liberator fired a standard .380 handgun round without visible damage, though it also misfired on another occasion when the firing pin failed to hit the primer cap in the loaded cartridge due a misalignment in the hammer body, resulting in an anti-climactic thunk. Assuming you do everything right in 3D-printing the Liberator, you should theoretically get at least one safe shot out of it (and potentially as many as ten safe shots out of it), according to Wilson (DR Disclaimer: Defense Review does not endorse the DefDist Liberator pistol–even though we support the idea and the ability of law-abiding citizens to 3D-print their own firearms–nor are we signing off on its safety. We haven't tested it, and we're not mechanical or chemical engineers. So, if you print and fire it, you're doing so at your own risk, so you should exercise all the necessary caution and avail yourself of all the proper safety equipment when doing so.). If you want to keep your hand and face, definitely DON'T try to fire 5.7x28mm ammo out of it. Notice we included the description "(almost) all-polymer" in the title. The Liberator reportedly utilizes a steel nail for a firing pin and incorporates a mechanically unnecessary metal component in order to comply with Johnny Law, specifically a federal metal-detection-compliance law. The caliber of the initial proof-of-concept test gun was .380 ACP, but Wilson told DR that he'll be testing a 9mm Parabellum/9x19mm NATO Liberator very soon. Go 9mm. If Wilson has his way, it's going to be a brave (and armed) new world. The matrix (and Dianne Feinstein) had better look out. Our only question is will the Liberator float (both figuratively and literally)? No way to tell, yet. © Copyright 2013 DefenseReview.com. All rights reserved. This material may not be published, broadcast, rewritten or redistributed without receiving permission and providing proper credit and appropriate links. David Crane started publishing online in 2001. Since that time, governments, military organizations, Special Operators (i.e. professional trigger pullers), agencies, and civilian tactical shooters the world over have come to depend on Defense Review as the authoritative source of news and information on "the latest and greatest" in the field of military defense and tactical technology and hardware, including tactical firearms, ammunition, equipment, gear, and training. Previous: MagnetoSpeed V1/V2 Barrel-Mounted Ballistic/Shooting Chronograph: Fast and Accurate! Next: Strike Industries (SI) Battle Case for iPhone 5 (and iPhone 4/4S) Protects from Dirt, Sand, and Water Splash!